This Kitten Pacifier Clip arrived in a very discreet package together with a set of Paw Print Overalls and a Bow. It was delivered from Australia by DHL in very non-descript packaging. The customs label stated toys and clothes which is great, and there was no mention of Onesies Downunder at all on the package. The sender was just listed as 'Andrew'. This is excellent news for anyone considering buying ageplay apparel from Onesies Downunder. They take customer privacy and discretion very seriously, so another big thumbs up from me for Onesies Downunder. Why use a Pacifier Clip? Pacifier clips are handy for several reasons, and I will list some below. Firstly they are the perfect way to attach a pacifier to your little. Hygiene, this is a big one for me, I hate the sight of a pacifier being dropped onto the floor or a dirty surface and a pacifier prevents this from happening. You don't want a pacifier coated in bacteria and germs going back in someone's mouth. Security, my little gets easily distracted when colouring or watching films so she can quickly drop a pacifier and lose it. A pacifier clip retains the pacifier if it is dropped so she can quickly locate it and put it back in her mouth. The Pacifier clips from Onesies Downunder are fantastic; they are very strong and are of a generous length. Measuring in at 13"/33cm in length they are an excellent size without getting in the way. One end features a strong elasticated loop which is threaded through a pacifiers handle before the rest of the pacifier clip is threaded through the loop to hold the pacifier securely at one end. This loop is colour coordinated to the pacifier clips design making it blend in well. It is essential that this loop is elasticated for safety reasons. If your little snags the pacifier clip on something as they move with a pacifier in their mouth, the shock absorbing properties of the loop will prevent any damage to their teeth. The other end features an ABS clip that is very simple to operate yet very secure when attached to a hemline or collar. This clip has three rows of teeth inside that effectively grip whatever it is attached to, and the clip locks in place quickly. The action of this clip is stunning in its simplicity, and yet it is fascinating to watch as it opens and closes (yes I am a bit of a geek). Once locked you have to lift the catch to unlock it physically, it can't accidentally come undone which is fantastic. There are currently a fantastic forty-one different designs to choose from. This is incredible, and all of the designs are bright and cheerful. This kitten design is delightful, and it features lots of different kittens playing while surrounded by toys, treats, food and paw prints. They look so cute, and Little Rae loves this particular kitten design. Each design is featured on other items from Onesies Downunder, and this is one of the beautiful things about the Onesies Downunder range of products. You can quickly build up completely co-ordinated outfits for every occasion or mixing, and matching designs is also fun. With so many designs to choose from it is easy to keep any little happy with bright and exciting options. These pacifier clips are double sided, with each side featuring the same bright design. The two lengths of material used in each pacifier clip are neatly stitched together to give a very strong product that will withstand a lot of abuse. The quality of these pacifier clips is excellent as is everything we have reviewed from Onesies Downunder. 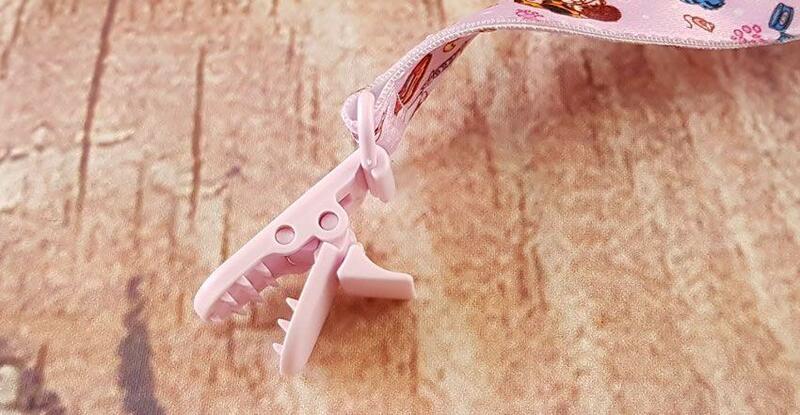 These pacifier clips are pretty much bomb proof in their design, there is nothing to go wrong, and the quality manufacturing processes are evident in the neatness of the stitching. Again Onesies Downunder have sent another quality product. The pacifier retainer is washing machine safe and so can be thrown into the wash with the rest of your little's clothing, this makes cleaning spills and stains a doddle. But enough of my waffling, the important person in this review is Little Rae, so let's hear what she thinks of this pacifier clip. "I like using diddy retainers; they stop me from losing my diddy when I drop it by accident which is something I often do when distracted by something fun. This happens especially often when I am engrossed in colouring or watching a film; it is so easy to drop a diddy while engaged in something. This diddy holder means that my diddy never touches the floor so I can blow it off and put it straight back in my mouth. I love kittens, and they look like they are having so much fun on it." Check out our other review of some of the Pacifier Cips from Onesies Downunder We love their design, and they are the perfect length to be useful without getting in the way. The safety loop used to attach them to a pacifier is fantastic, and the clip on the other end is an engineering marvel. The designs on offer are fantastic, and Little Rae loves this kitten one. It is another superb product from the market leader, Onesies Downunder. 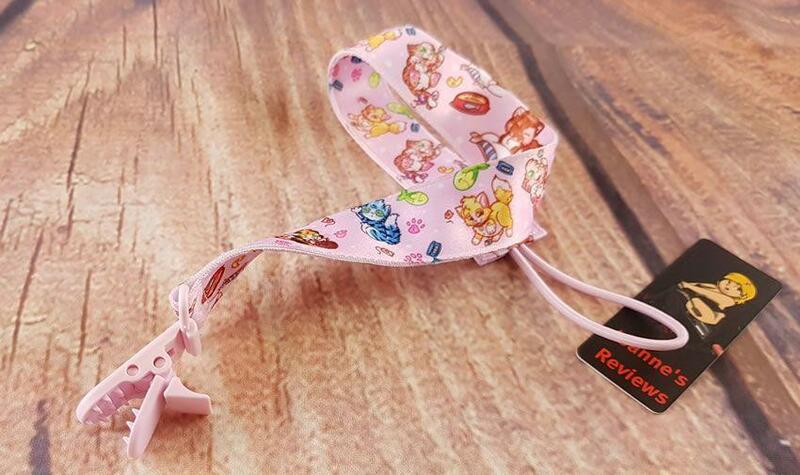 I was sent this Kitten Pacifier Clip by Onesies Downunder and I would like to thank them for giving me the opportunity to review it for them. Grab one or more of these fantastic pacifier retainers from OnesiesDownUnder for just $4.95 AUD (£2.70) and that is fantastic value for money as they are currently on sale so grab one while you can.